Since 1967, Brunei Language and Literature Bureau through the publication of Mekar magazine has opened it opportunities and interests from teenagers and students to compose short stories and poems to fill the available space. This situation has lasted for fifty years, and the Mekar magazine has produced so many great talented writers, among which can be called Awang Damit, Muslim Burmat, Salleh Abd. Latiff, Adi Marhaen, Rusman Ali, Pengiran Aji Pengiran Mohd Tahir, Morshidi Haji Marsal, Chong Ah Fok, A. Mohammad Haji Timbang, Aminah Haji Momin, Zefri Ariff, Faridah Abdul Hamid, and so many others - even to give a birth to a literary writers is not as easy as we thought. [...] as young children and as adults indicate the gulf between childhood and maturity and suggests the importance of considering that gulf in planning literature instruction. [...] There is, fortunately, a growing body of literature well suited for adolescent readers. It has not always been considered respectable, and by many it still is not, but literature written for adolescent has, in the past several decades, attracted the attention of many librarians and teachers as well as the students themselves. [...] Literature for adolescent is, in other words, now a significant body of works that merits the attention of English teachers. Before that, there were some research and publication of books on teen literature from scholars in America. Among them is G. Robert Carlsen with his book Books and the Teenage Reader: A Guide for Teachers, Librarians, and Parents (1980); Kenneth L. Donelson and Allen Pace Nilsen with their book Literature for Today's Young Adults (1980) which among others discusses the history of teenage literature and contemporary work for teens. Sheila Schwartz has also talked about the methodology and analysis of a large number of teenage books based on the theme group through his book Teaching Adolescent Literature: A Humanistic Approach (1979). [...] Literature has its own standing in all societies. All humans from childhood to adult are generally close to the literature. Among the literary levels that are always forgotten is the children's literature. It is therefore evident that the literature of children and adolescents is a very important platform in order to fill the mindset, character formation, spirituality, and the psychological enhancement of adolescents and students, especially when the country enjoys the information and communication technology era. However, the inclusion of multi-genre teen literature has been found largely on the market and it is also a concern for teenage readers as well as to be offset by research from various aspects. When the Internet was introduced and became the main channel of communication, or information, and media as the delivery mechanism for collaboration and intermediation between individuals and computers regardless of geographical location, the learning process traditionally turned into a 'computer-assisted learning system', even entering a 'virtual learning system' . Thus, the field of children literary and adolescents is no exception to this mainstream. Starting with oral tradition, changing form writing into printed material, and now they has entered the virtual world with the new face and image quality built into a more compelling 3D combination. [...] it is now possible for more people than ever to collaborate and compete in real time with more other people on more different kind of work from more different corners of the planet and more equal footing than at any previous time in the history of the world using computer, e-mail, network, teleconferencing, and dynamic new software [...] the flattening the world means that we are now connecting all the knowledge centers on the planet together into a single global network. However, since the beginning of Mekar magazine's existence, there is still a positive sign in the development of children's literature and youth in Brunei Darussalam. 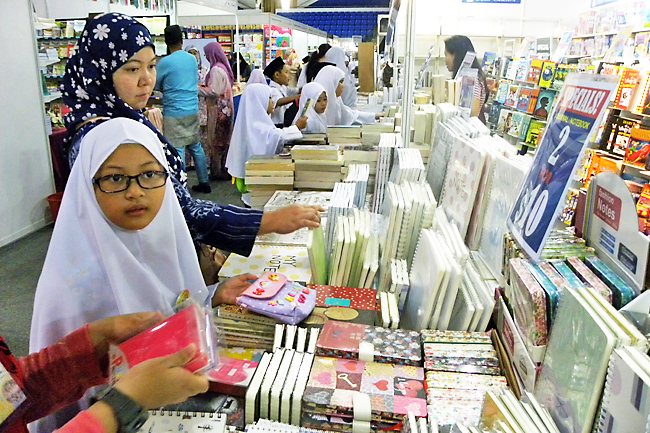 Among others, the first form of presentation and publishing techniques has been enhanced and diversified with content and space that are relevant to the Malay Islamic Monarchy concept as a special philosophy to address the survival of children and adolescent literature in the country. This concept has been emphasized since Brunei Darussalam achieved full independence in 1984 to be studied and admired by adolescents and students to the institutions of higher learning. Secondly, at the beginning in the 1980s, several essays and literary works in the form of short stories and poems of children and youth who have been published in the Mekar magazine have been recognized and evaluated for publication in the form of anthology books, such as the ‘Untaian Mekar’ (1976), 'Merpatiku Sayang' (1988), 'Tanahairku' (1989), ‘Sesekali Angin Bertiup’ (1997), and ‘Aku Anak Brunei' (2012). Some of the writings that won in several Mekar Magazine Student Write Contests by BLNG - DBP held since 1984 were also given a proper prize or award. This proves the earnestness of the Language and Literature Bureau to expand and to place children's and youth literature in this country at a reasonable and important level in our busyness with the current vibrancy of physical, economic, and informational development. 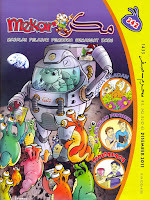 Thirdly, the Mekar magazine which is containing a number of literary and literary works of children and adolescents has now become an additional reading material in the subjects of the students in school, and is used as a study material by several faculties in institutions of higher learning in fulfilling certain goals in various academic majors. This can be seen through the scientific exercises ever made by several students at University of Brunei Darussalam, among them by Hajah Salmah binti Haji Abd Hamid with the title of his study “Penggunaan Bahan Sastera dalam Pengajaran Bahasa Melayu di Kalangan Guru Sekolah Menengah Bawah di Daerah Brunei Muara” or "The Use of Literary Materials in Malay Language Teaching in Middle School Teachers in Brunei Muara District" (1999). Similarly with Nor Ashiddeq bin Haji Hamdi with the title of his study “Penggunaan Bahan Sastera dalam Pengajaran Bahasa Melayu: Satu Tinjauan di Sekolah Rendah Tumpuan Telisai, Tutong II” or "The Use of Literary Materials in Malay Language Teaching: An Overview at Telisai Concentration Primary School, Tutong II" (2007); Haslina binti Haji Abdul Kahan with the title of his study “Penggunaan Bahan Sastera dalam Pengajaran dan Pembelajaran Bahasa Melayu di Salah Sebuah Sekolah Rendah” or "The Use of Literary Materials in Malay Language Teaching and Learning at One Primary School (2010); and Mohammad Erul Nizam bin Aiadin with the title of his study “Penggunaan Bahan Sastera dalam Pengajaran Bahasa Melayu di Peringkat Sekolah Menengah Tahun 7” or "The Use of Literary Materials in Teaching Malay Language at the Secondary School Level 7" (2011). Overall, adolescents can be seen from a number of perspectives, and from the perspective of any criteria and value being applied, among them is adolescence is the transition from childhood to adulthood as a condition demanded for the progress of society. 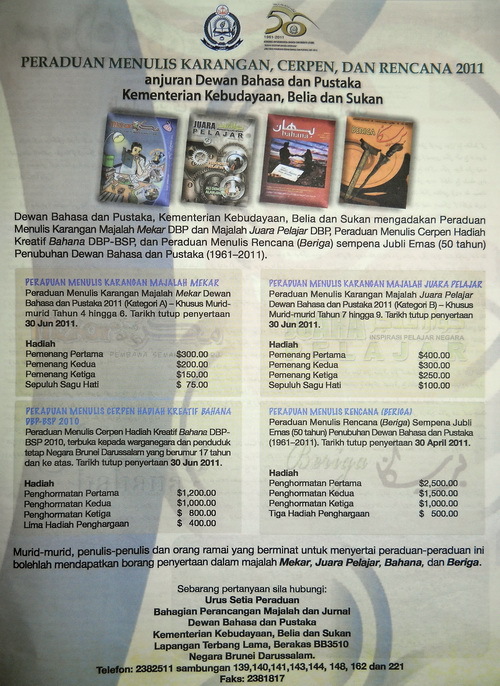 Therefore, the development of children's literature and teenagers brought by the Mekar magazine, in particular, Brunei Language and Literature Bureau at present can be regarded as in line with the process of growth and growing of the children themselves, that there is a close and synonymous relationship between literature and children in this country. Azhar Hj Wahid (Peny. ), 2011. Globalisasi Sastera Siber. Tanjung Malim: Penerbit Universiti Pendidikan Sultan Idris. Friedman, Thomas L., 2005. The World is Flat: A Brief History of Globalized World in the 21st. Century. London: Penguin and Allen Lane. Hadijah Rahmat, 2006. Peranan dan Perkembangan Sastera Kanak-Kanak. Kuala Lumpur: Dewan Bahasa dan Pustaka. Jumali Selamat, 2012. Sejarah Perkembangan Novel Remaja di Malaysia. Kuala Lumpur: Dewan Bahasa dan Pustaka. Loh Mei Pei, 1991. “Novel Remaja Sebagai Bahan Bacaan Sastera dalam Sukatan Pelajaran KBSM Bahasa Malaysia Menengah Atas: Satu Analisa dari Aspek Tema, Perwatakan dan Gaya Bahasa”. A Thesis for Jabatan Persuratan Melayu. Bangi: Universiti Kebangsaan Malaysia. Matlob, 1964. Sastera Alam Kanak-Kanak. Kuala Lumpur: Pustaka Antara. Misran Rokimin, 2013. Kritikan Sastera Remaja: Teori dan Aplikasi. Bangi: Penerbit Universiti Kebangsaan Malaysia. Nor Raudah Hj. Siren, 2006. Falsafah Diri Remaja dalam Novel Remaja Melayu. Kuala Lumpur: Dewan Bahasa dan Pustaka. Nurazmi Kuntum, 1997. Kaedah Mengajar Sastera. Bandar Seri Begawan: Dewan Bahasa dan Pustaka Brunei. Othman Puteh, 1989. Sastera Remaja di Tinjau Daripada Beberapa Perspektif. Kuala Lumpur: Dewan Bahasa dan Pustaka. Othman Puteh, 1998. Tanggapan Terhadap Kesusasteraan Remaja. Kuala Lumpur: Dewan Bahasa dan Pustaka. Othman Puteh dan Abdul Ahmad, 1984. Sekitar Sastera Kanak-Kanak dan Remaja. Kuala Lumpur: Dewan Bahasa dan Pustaka. Probst, Robert E., 1984. Adolescent Literature: Response and Analysis. Ohio: Charles E. Merill. Simpson, J. A. dan Weiner, E. S. C., 1989. The Oxford English Dictionary Volume I. London: Oxford University Press. Talib Samat, 1992. Menangani Penulisan Kreatif Sastera Remaja. Kuala Lumpur: Dewan Bahasa dan Pustaka.